You've been there. We all have. You say or do something to damage an important relationship. Maybe you lose your temper and tell a loved one to get out of your life. Maybe people are counting on you to do something and you let them down: You forget to make a bank deposit, you back out of a planned vacation at the last minute, you lie about something important, you don't show up when it was important to do so, or you share information that you promised to keep private. As a child, you learned the labels for what you were feeling from your caregivers. Is that tightness in your throat fear or excitement? Is the tension in our muscles anger or fear? Those around you gave you labels for what you were experiencing in your body with statements like, "You're such a ball of nerves today," "Stop crying, you're just mad you didn't get your way," or "I'm guessing you're pretty mad at your mom." Reinforcement is a term used in operant conditioning to refer to anything that increases the likelihood that a response will occur. If every time you stay home on Sunday night your child performs better on the tests on Monday, and you are more likely to stay home because of that, then your child performing well on Monday tests reinforces your staying home the night before. When other people reinforce you for being with them, you want to socialize more. There are many reinforcers for behavior. Among the naturally occurring reinforcers, social reinforcement is one of the most commonly occurring. Social reinforcers come from other people and include smiles, hugs, praise and attention. Social reinforcers are powerful. Acceptance and approval of others means you are part of the group/family and communicate that you are a lovable person. Imagine that your daughter is late coming home. It's 3 AM and she hasn't called. The roads are wet--it's pouring rain. You are terrified. The minute she finally walks in the door, you're angry. You scream about how inconsiderate and irresponsible she is. Then she's back out the door, yelling that she hates you. You sit with your head in your hands. So many times you've been through this and promised yourself you'd handle it differently. But you can't just let her walk all over you, right? You survived the holiday. Maybe it was a good holiday, one you enjoyed. Then suddenly Monday comes, the Monday that all goes back to the same routine. Not only are you hit with all the issues that have been put on hold for two weeks, you also hear about the fantasy holidays that some people enjoyed. Suddenly your holiday pales in comparison. I’ve been thinking about priorities and demands. That’s an interpersonal skill in DBT. Priorities are what you want, what’s important to you. Demands come from other people, what they want you to do. The idea is to have a balance that helps you live your life effectively. So how does this actually apply to your life? Strengthening relationships and feeling less lonely is a challenge for emotionally sensitive people and can be overwhelming. 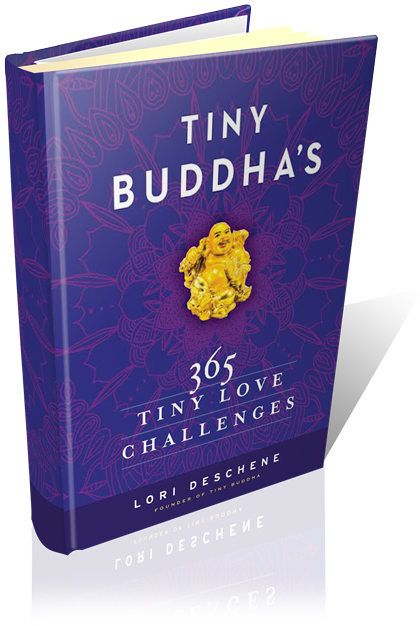 Tiny Buddha's 365 Tiny Love Challenges offers a step-by step model that is easily understood and gives the reader a way to move forward. I am grateful to Lori Deschene, the author, for answering a few questions about her work. How did you get the idea for Tiny Buddha’s 365 Tiny Love Challenges? I knew I wanted to write a book about strengthening our relationships, both because authentic connection is such a huge part of Tiny Buddha, and because I’ve personally experienced the consequences of shutting people out. For years when I was younger I isolated myself in shame, afraid that people would reject me if they knew about my struggles and shortcomings.